A dash camera is a smart purchase for any vehicle owner. Capable of keeping watch over your car each time you drive, a dash cam provides incontestable evidence of whatever occurs on the road. The benefits to having full video coverage are evident: dash cam footage can be used to clear yourself of fraudulent insurance claims, can be used to get you out of a low ticket. It can be used to watch over your vehicle whenever you step away, or just to record the beautiful scenery on your next cross-country trip. Below, we’ve put together a list of our favorite ways to get a full 360-degreecoverage of your vehicle. Some of these options are merely camera mounts, which allow the camera to be hung from the rearview mirror and swiveled around. Others are actual cameras whose lenses are adjustable internally – so no need for a mount. Another is a dual channel camera with two cameras – one pointing forward, the other pointing behind. Whatever style you prefer, each of these options will give you the full 360-degree dash cam coverage you are looking for. How Does a 360 View Dash Camera Work? The AmorTek mirror mount attaches to the body of your rearview mirror and comes with seven different joint kits that fit most dash cams on the market today. The ball in socket joint allows you to rotate the camera a full 360 degrees and position it to your exact liking. The 9.7mm ultra-slim body means the mount takes up little space within the vehicle. The anti-slip and anti-shake design ensures that the camera always stays positioned securely within your car. 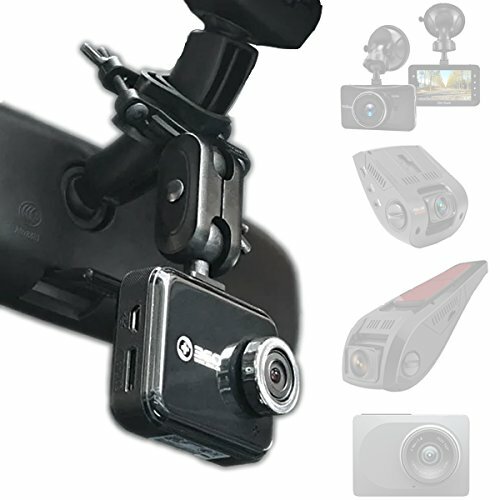 If you already own a dash camera, the AmorTek is a good cheap option to enable your camera to be able to record in any position. The NuCam is a high-end dash camera that records in full 1080P. Shaped like a cylinder, the NuCam can be rotated a full 360 degrees without the need for an additional mount. 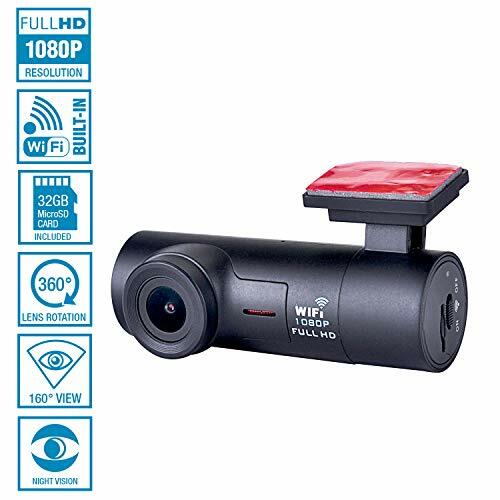 It is WIFI compatible meaning that you can connect to a network via the camera and instantaneously view, edit upload your video to social media via a smartphone or tablet. The built-in G-sensor initiates automatic recording when it senses some unusual vibration meaning that when positioned in the vehicle, you don’t have to worry about lacking footage from an accident or a bump in the parking lot or some other important event. The FalconZero dash cam is a dual channel device meaning that it contains two functioning cameras. The front-facing device and the back-facing device are each rotatable 180 degrees and capture 120 degrees of the view in front of you from the wide-angle fisheye lens. 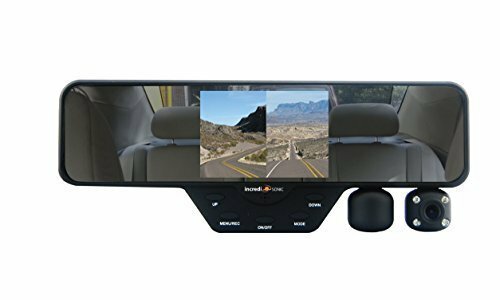 The device fits over any rearview mirror, and the 3.5” LCD screen gives a clear picture of the view in front and an inset of the rearview behind. Comes with superior night vision capabilities and loop recording meaning the camera will delete oldest files first and continue recording. The Venture X1 is an excellent, high-end dash camera that films in full HD, so you never miss an important detail like a license plate or a road sign or the features of another driver’s face. Its compact size means that it does not prove to be an eyesore in the vehicle and fact, looks almost like a point and click camera. A six-layer glass lens ensures premium night vision recording and the camera automatically adjusts exposure to light for the best image. The Venture X1 also comes with a parking mode function that automatically starts recording whenever a moving object comes within 13 feet of your vehicle. The G-sensor records and locks any footage that is recorded after sensing a significant bump in the vehicle, so you never have to worry about recording over an important file. The Digit harbor mirror mount is similar to the AmorTek mount in shape and design. The device comes with four different joint kids who fit most cameras on the market today meaning that you don’t have to worry about adaptability issues. The Digit harbor is easy to install and easy to use, and the sturdy design promises to stay secure even during a rough ride. The ball in socket allows for complete rotation making it easy to point the camera forward or behind you. The small size of the Digit harbor will not impede the view of the driver or appear distracting to other passengers. In the case of dash camera footage, more is better. A wider angle gives you more view of the road in front of you, but a 360-view dash camera allows you to reposition the camera at any point to record any angle of the road or interior of the car. The truth is, you are just as likely to get into an accident at the front of your vehicle as behind – think of backing out of driveways, fender benders in parking lots. With the flexibility and full coverage of a 360-degree dash cam set up, you can be sure you won’t miss important footage. Most dash cams worth buying today come with a wide-angle fisheye lens that is capable of seeing more of the road in front of you. Typically lower end dash cameras can offer a wide-angle capture of up to 170 degrees. Other pricier dash cameras can offer views up to 270 degrees, almost a full three lanes of traffic. While no dash cam on the market can film all 360 degrees simultaneously, the closest you’re going to get to total coverage is either a dash camera whose lens can be repositioned within the camera itself. Or a camera that can be affixed to a swivel mount that allows the camera to be moved around, or a dual channel dash camera which records the front and back of the car simultaneously. Regardless of which of these options you seek to go with, there are ways of ensuring you can record a full 360-degree view as you drive. A dash camera gives peace of mind to the driver and having an eye on your vehicle that can be readjusted and repositioned as you like you total control over what you film. Accidents happen when you least expect it and from unlikely angles. With a 360-degree dash cam set up, you can be sure that you won’t miss a significant moment. This footage is your biggest ally when it comes to proving your innocence to insurance companies and law enforcement.